Heat butter in a heavy-based pan and cook onions over a low heat until caramelised. Split each pita bread in 2, horizontally. Slice each chevin into 8 rounds. Top each round of pita with a little caramelised onion, a round of goat’s cheese, a few thyme leaves and a drizzle of olive oil. Place under the grill until the cheese begins to brown and the pita is toasted. 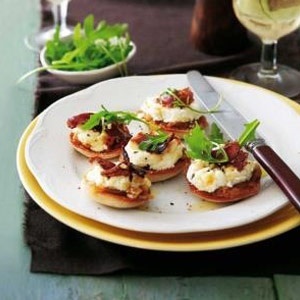 Top with biltong and rocket leaves and serve immediately.